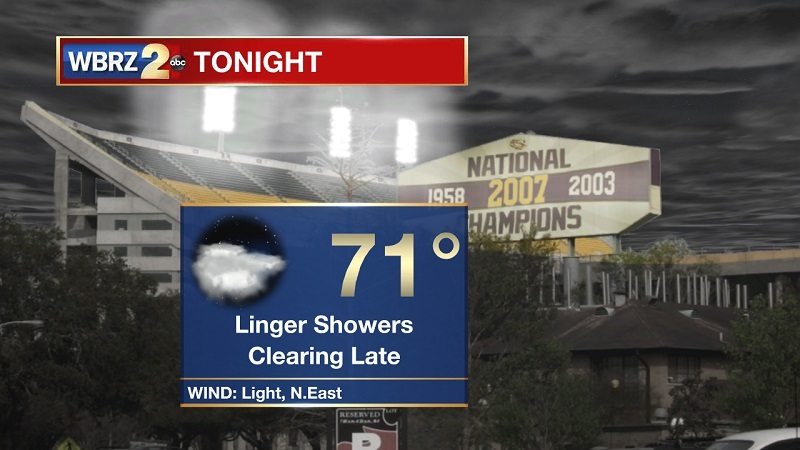 Tonight and Tomorrow: Showers are still lingering across the area this evening up until 11 PM, but they will taper off and become more isolated as the night continues. Clouds will be breaking overnight, but only slightly into Sunday morning. Temperatures will be dropping slowly this evening, eventually reaching an overnight low of 70° with light winds out of the northeast. Cloudy conditions will be sticking around into Sunday, which will help to keep temperatures in the 70s through the majority of the morning. Light showers will be possible along the coast, and they will attempt to push inland as temperatures warm into the 80s shortly before noon. Spotty showers and storms will stay in the forecast until 6 PM, with lingering pockets of drizzle until 9 PM. Temperatures will reach a high of 86°, with dew points in the low to mid 70s. Up Next: The stationary front is still along the coast, which is keeping moisture moving onshore through the warming of the day. This will dissipate as a mid to upper level ridge builds over Georgia and Alabama Monday and Tuesday. Unfortunately, that will keep us on the west side of the ridge, and isolated, afternoon showers in the forecast through the midweek. This will also keep temperatures around 90°, and conditions humid until late in the week. Drier conditions will be the case Thursday and into Friday, and temperatures approach the mid to upper 80s into next weekend. The only named storm or tropical wave currently in the Atlantic, is Tropical Storm Leslie, which gained tropical storm status earlier today. She is currently about 750 miles east-northeast of Bermuda, with maximum sustained winds of 50 mph, and is moving southwest at 6 mph. This general motion is expected to continue through Sunday. 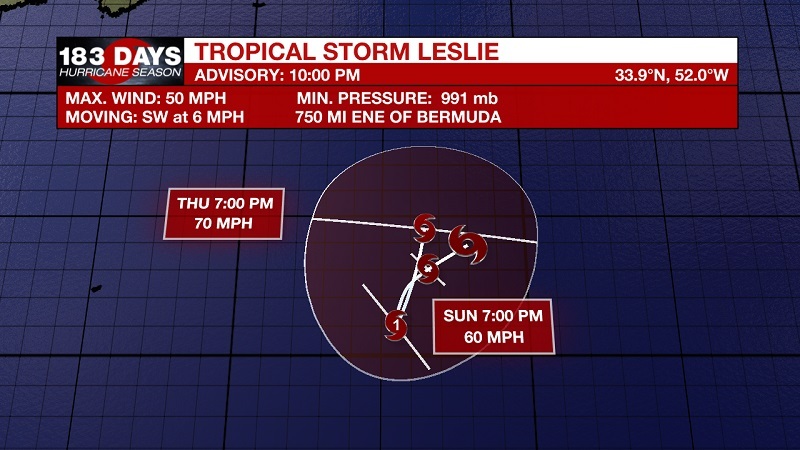 A slower forward motion is anticipated by Sunday night, and Leslie is forecast to move very little on Monday and Tuesday. Some slow strengthening is possible over the next few days. The stalled and weakened frontal system that was trying to bring cooler and drier conditions across the area has all but fallen apart into the Northern Gulf. There is enough of a frontal boundary to keep some isolated showers and storms pushing inland through the late morning and into the evening hours as temperatures warm through the day on Sunday. 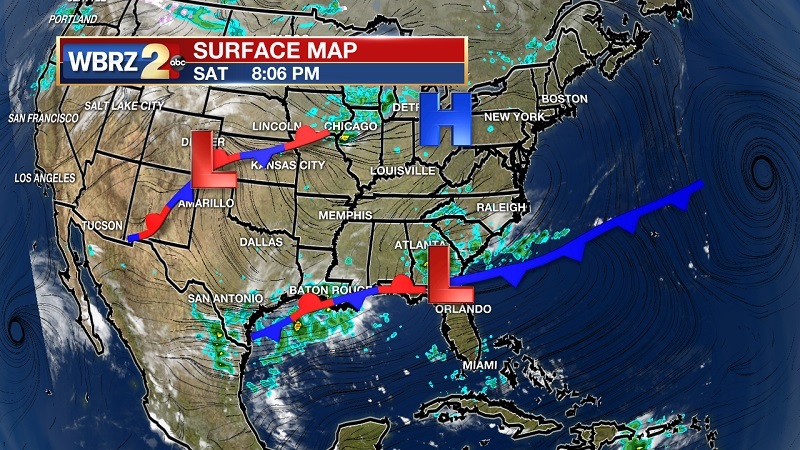 This front will be dissolved through Monday, as a ridge sets up to our northeast. The ridge will help to bring slightly drier conditions into the area in the form of rainfall, but prevailing winds will be out of the south through much of the week to provide hot and humid conditions. It will begin to break down through the latter half of the week, helping to bring a return to scattered afternoon showers and storms, but also cooling temperatures back near average. We are keeping our eye out for the first intact cold front of the season, and long range models are suggesting it to break through the second week of October. This is seen on the American (GFS) model, but timing and intensity could change, so stay tuned.